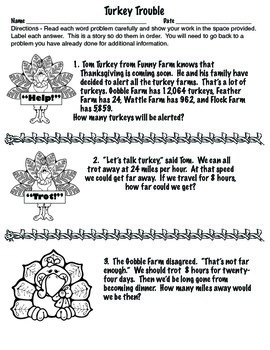 Your students will stay engaged with these entertaining Thanksgiving math problem solving task cards that become a fun story. There are 12 self-checking problems with the answer on the back. 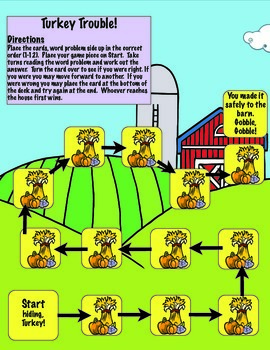 Students can either play a board game with them or color a turkey as they solve the problems. These same word problems also come in worksheet form. Other choices include how your students work or record their answers. Math skills included in this resource include Addition, Subtraction, Multiplication, Equation, Fraction of a Number, Rounding, Area, and Elapsed Time. These task cards, worksheets, games, and activities can be used with cooperative groups, independently, in centers, for fast finishers, or as an assessment. 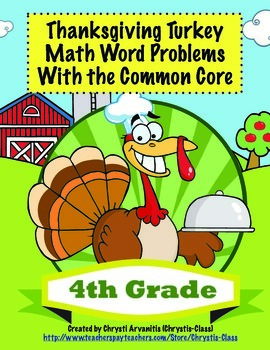 * 3 page Students Recording Sheets with 4 turkeys on each page that can be used with task cards or worksheets. Students identify key words in the problem, draw a picture, write the number model (equation), and their answer.